The Inn at Narrows Creek has five available guest rooms and suites. Each room is decorated in its own charming and distinct character. Each morning, a country breakfast and gourmet coffee are leisurely served in your room. Each room is beautifully decorated with antiques, reproductions, and primitive folk art. All rooms feature a working fireplace, entertainment center, dining tables, air conditioning, wireless high speed internet access, and a private bath and shower. Each of our four suites also have a two-person whirlpool tub, terry-cloth robes, and sitting parlor. Our guest room and the Sunflower and Americana suites have a maximum occupancy of two guests. 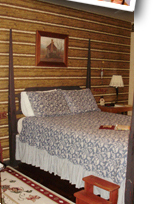 Both the Lodge and Log Cabin Suites can accomodate families of 4 and as well as pets (for an additional charge of $10). The Lodge and Log Cabin Suites also have separate private entrances. None of the guest rooms are fully wheelchair accessible or otherwise fully ADA compliant. Click Here to request a reservation online.